Article of Giorgos Marinos, member of the Political Bureau of the Central Committee of the Communist Party of Greece. An abridged version of the article was published in the German journal, "Marxistische BlÃ¤tter," issue 5, 2012. It is a fact that when we refer to the complex problems of the Communist and labour movement, especially when we refer to problems related to the strategy of the Communist parties, and to the policy of alliances we are required to enhance, different approaches and disagreements are apparent in the ideological-political discussion of issues. Let usÂ put forward arguments, so that the various positions are tested based on real experiences, Marxist-Leninist principles and the experience of the Communist and labour movement. In this way hackneyed formulas will be avoided and the discussion or debate will contribute to the drawing of conclusions, to the strengthening of the positive features in the strategy and tactics of the communist parties or to the rejection of mistaken positions and to their correction. All these things must have one goal. The communist movement must lay solid revolutionary foundations and overcome its crisis, to become more capable in the struggle to organize the working class, to build the necessary socio-political alliance, to acquire a higher level in the effort to concentrate forces with the aim of escalating the conflict against the forces of capital, for the overthrow of capitalist barbarity, for socialism. Unquestionably the liberal and social-democratic parties as well as the parties which have abandoned the principles of the Marxist-Leninist worldview and have slid down the path of class conciliation, and opportunism have taken a clear position. They have chosen the path of defending and managing capitalism regardless of the excuses and pretexts they use. What we need are communist parties that believe in the principles of the class struggle, the historical necessity of the struggle for the overthrow of the regime of the exploitation of man by man, the construction of the new society, socialism-communism, to adapt their strategy and tactics to these goals which are the essence and raison d’etre of a communist party, the greatest possible contribution to the interests of the working class and popular strata. 1. The KKE has taken on its share of responsibility. It advances forwards in a measured and thought out way on a very difficult path, it draws experience from its history, fights against its weaknesses and adjusts its strategy and tactics (which flow from strategy), to the needs of the concentration, education and organization of working class popular forces in the workplaces and neighbourhoods based on a non-negotiable goal. The rupture with big capital and the imperialist unions for the overthrow of the power of the monopolies, the overthrow of the exploitative relations of production and their replacement by working class, people’s socialist power, socialist relations of production. The KKE many years ago, in 1996 at its 15th congress adjusted its strategy and tactics to the new needs created by the development of capitalism, the dominance and strengthening of monopoly capital, the assimilation of Greece into the imperialist unions the European Union and NATO. Through the study of the objective situation, assessing that capitalist relations of production have (further) developed in Greece and that capitalism is in its highest (monopoly) imperialist stage it came to the conclusion that the material pre-conditions for socialism have matured even further. The congress mentioned that in our era, the era of the passage from capitalism to socialism, the class struggle is directed towards the resolution of the basic contradiction between capital and labour. The revolutionary change in Greece will be socialist. The motor forces of the socialist revolution will be the working class as the leading force, the semi-proletarians, the poor farmers and the most oppressed sections of popular urban petty bourgeois strata. On this basis the anti-monopoly anti-imperialist line of rallying was determined as an instrument, as a means to concentrate forces, a foundation for the alliance policy of the party and its activity in the labour and people’s movement with the aim of resolving the central problem of power, the winning of people’s power which will transform the economic base with its basic characteristic feature being the socialization of the concentrated means of production and central planning. The necessary adjustments in the following 3 congresses were made in this direction, enriching the strategy and tactics of the party. And this feature is particularly apparent at the 18th Congress in 2009 where the strategy of the KKE was enriched with the utilisation of a special decision on the causes and factors which led to the overthrow of socialism, mainly based on the experience of the Soviet Union. It is obvious that the KKE by adjusting its strategy to the new needs of the class struggle, escaped from the rationale of "stages" which was a characteristic feature of the strategy of the communist movement over the past decades and remains in the programmes of many communist parties. The decision of the KKE is supported by the objective reality which highlights that there can be no intermediate socio-economic system (between capitalism and socialism-communism) and consequently there can be no intermediate form of power. The rationale of the intermediate stage refers to a transitional situation which regardless of the correlation of forces which may be expressed through the strengthening of the position of a CP in parliamentary elections cannot solve the two critical problems regarding power and the ownership of the means of production. Unquestionably if there is no revolutionary overthrow , the power, the means of production, the wealth produced by the workers will remain in the hands of the bourgeois class, the conditions (objectively) will not exist for the satisfaction of the people’s needs, capitalist exploitation will be perpetuated and consequently this situation will be short-lived, it will accumulate problems for the people and expose the communist party, it will place it in the vicious circle of assimilation into the system. The new strategy of the KKE despite the difficulties created by the period of the counterrevolution and the restoration of capitalism in the Soviet Union and the other socialist states, despite the consequences of the inner-party crisis and the split of 1990-1991, provided significant impetus to its struggle. It acquired new positions in the trade unions and other organizations in the popular mass movement. It developed its links with the working class, with the farmers, with urban intermediate strata. It took important steps in party building, in developing activity amongst the youth, the Communist Youth of Greece was strengthened. The party acquired a substantial parliamentary presence and made an important contribution to the effort to regroup the international communist movement and face its ideological-political and organizational crisis. We know very well the counter-argument and the arguments which are used against the strategic direction of the KKE and we table our arguments for discussion and for reflection in an attempt to highlight the objective elements which lead to this choice. Capitalism is a historically outdated system which no form of management can give a human face. We are talking about the traditional liberal and social-democratic management as well as the form of management which presents itself as "left-wing", "new left", "progressive" etc. and have provoked discussions within the communist movement. We cannot examine intentions, even more so in instances where in the bloc of forces which have undertaken governmental responsibilities in their countries include communist parties with which the KKE as a rule maintains good bilateral relations. We focus our attention on the laws of the system themselves. On the basic law for the acquisition of surplus value, unpaid labour and profit for the monopolies which is the core of the exploitative nature of capitalism and is not altered by any form of management whatever it is called. Since the functioning of this law regardless of the policy formulas implemented determines the exploitative character of the economy. We focus our attention on the sharpening of the basic contradiction between the social character of production and labour (on the one hand) which sets millions of worker in motion, workers who produce the wealth and the (on the other hand) the private capitalist appropriation of the results of this process which operates in our period at higher levels than before and is based on the power of capital and its ownership of the means of production. It is precisely this contradiction which leads to capitalist crises, makes the system constantly more aggressive and more reactionary. And this has been demonstrated by the recent experience of the capitalist crisis which has affected Greece, Spain, Italy, Portugal, Ireland and other EU member-states as well as the USA, Japan and other capitalist countries according to the phase of the cycle which each country finds itself in. This contradiction cannot be overcome by any formula for the management of the system and the downgrading of the basic contradiction, in the name of "national specificities" which traps communist parties in mistaken positions. We focus our attention on the imperialist aggressiveness and the sharpening of the inter-imperialist contradictions for the control of raw materials, the division of markets and spheres of influence which are the basis for the outbreak of imperialist wars. And this does not only concern the historical experience of previous eras, it is not restricted to the two world wars. It also concerns dozens of other local and regional wars, wars which we are experiencing in our era, such as those in Yugoslavia, Afghanistan, Iraq, and Libya. It concerns the intervention in the internal affairs of Syria, the threats against Iran, the danger of a generalized imperialist war in the Eastern Mediterranean, the Persian Gulf, the wider region. And these contradictions cannot be overcome by any bourgeois management. Even more so by the distorted, non-class treatment of international relations which leads to entrapment in the dead-end rationales of "democratization" of the imperialist unions and organizations, of NATO and the EU, the illusion of the so-called "multi-polar world", even to the degeneration of participating in governments which waged imperialist wars (like the war against Yugoslavia), or more recently the justification and support for the imperialist war in Libya ( for example the stance of a section of GUE/NGL MEPS). The position that capitalism is a historically outdated system does not only concern Greece or other capitalist states with an intermediate position in the imperialist system which have been intensely affected by the crisis. It concerns the system as a whole including the strongest developed capitalist states where the high level of the exploitation of the working class is a characteristic feature (due to the increase of labour productivity) and the high profitability of the monopolies. And in these states (e.g. USA, Germany, France, Britain, Japan etc) it is undeniable that there the people’s needs cannot be satisfied, the level of unemployment remains high, labour and social security rights are being abolished, social services are being commodified. What is the response to this situation from the standpoint of the interests of the working class, the popular strata, from the standpoint of social progress? The response is the development of the class struggle. The development of the ideological-political and mass struggle for the overthrow of capitalist barbarity, crises, wars, unemployment which is the scourge of millions of workers, poverty. The development of the class struggle, first of all on a national basis, where the contradiction of capital and labour is directly and clearly manifested. And also with real coordination at an international level, with the communist, revolutionary parties as protagonists and social forces the interests of which lie in fighting against the monopolies, capitalism and the imperialist unions. The response is the struggle for socialism. And this is not an academic issue. This is not simply just another issue. It is the basic and the dominant issue that determines all the others. The reference to the term socialism in the programme, or in the documents of a communist party or the acceptance of the necessity and timeliness of socialism are not enough. This is generally the case but it is of little value when the other programmatic choices overshadow the struggle for socialism and the tactics which are determined are fragmented and arise from an intermediate goal for the management of the system. The basic issue is the struggle for socialism and the demands that it has. So that this struggle will determine in practice the orientation in the labour movement, the political framework in which the communists struggle against capitalist exploitation, the demands, the goals of struggle, the building of the class unity of the working class, the alliance policies, the elaborations of the party on the people’s problems. So the exploitative system, the forces of capital and its political representatives must find themselves in the dock, the alternative solution must be promoted which is not general or vague like "development", "democracy", "social progress", but development (socialist) with as its criterion the satisfaction of the people’s needs without capitalists and capitalist profit, with the passing of wealth produced by the workers into their control. Only in this instance, in a very hostile environment, where the capitalists and the bourgeois state use the most modern methods of manipulation, intimidation, repression and opportunism is carrying out an organized attempt to corrupt the people’s consciousness can you assist the development of the consciousness of the working class and popular strata and prepare and mature the subjective factor so that it corresponds (as far as is possible) with the needs of the class struggle. And this must lend impetus to the workers’ struggle, so that they decide to take part in activity even in the most difficult conditions, to come into conflict at the side of the revolutionary party with their class opponents. Otherwise (if this battle is not fought) the working class, the poor popular strata, the interests of which (objectively) are in direct contradiction with capitalism, will accept the exploitative system as the only solution and will be worn down in every version of bourgeois management, and will be disarmed. Some comrades say "the correlation of forces is negative, we cannot talk about overthrowing the system, about socialism." We respond in a determined fashion. This approach is mistaken. Of course the socialist revolution is not on the agenda today, the preconditions have not been formed for a revolutionary situation which is an objective development and has to do with a deep political crisis which will manifest itself, something that was noted by Lenin in the "Collapse of the 2nd International". I.e. that these above can no longer govern has they had done and those below do not tolerate being governed by the former. But this does not mean that communists will "sit on their hands" and seek replacements for the management of the system in the rationale of the "lesser evil". The continuous combative effort to organise the working class, to change the correlation of forces in the labour and peoples movement above all and not only in the parliamentary processes is duty for the communists. A change in the correlation of forces (which are not immutable), providing qualitative class features, the real alternative solution which will prepare the working class for tough confrontations. In any case the necessity of socialism is not determined by the correlation of forces. This has not changed in our era which is era of the passage from capitalism to socialism despite the painful counterrevolutionary changes. What determines and determined the obsolete pre-capitalist socio-economic systems was the maturation of the material pre-conditions for the construction of a new higher socio-economic system or sharpening of the contradictions which are present in the old system. It is the sharpening of the contradiction between the productive forces and the obsolete relations of production which destroy or hinder the development of the productive forces. Today the determining factor is the lack of correspondence between the social character of production and labour with the private ownership of the means of production. And this is the basis which gives rise to the necessity of struggling for socialism. The KKE does not underestimate the difficulties of the class struggle and the complex developments which the CPs has to face at an international level. It follows very carefully the developments in e.g. Latin America in particular, it consistently expresses its solidarity with the struggle of the Communist Parties. It studies the processes amongst the peoples, the course of the governments which have been elected with slogans regarding the solution of the people’s problems and it draws conclusions from this experience based on the political line that is implemented, their class character and of course the stance in relation to the two basic issues. The character of power and the ownership of the means of production. On this basis we note that the alteration and underestimation of these two fundamental issues and the replacement of scientific socialism by the rationale of so-called "21st century socialism", which is promoted by social-democratic forces and means entrapment in the illusion of a "humanized capitalism" and disarms the struggle of the working class. The classics of our worldview posed the necessity of overthrowing capitalism from the "Communist Manifesto" onwards. They posed it later even more urgently, utilising the experience of the first proletarian revolution, in the "Paris Commune". The following extract from Engel’s’ 1888 prologue to Marx’s text On the Question of Free Trade is characteristic. "misery of the great mass of the people, in consequence of overproduction. This overproduction engendering either periodical gluts and revulsions, accompanied by panic, or else a chronic stagnation of trade; division of society into a small class of large capitalist, and a large one of practically hereditary wage-slaves, proletarians, who, while their numbers increase constantly, are at the same time constantly being superseded by new labour-saving machinery; in short, society brought to a deadlock, out of which there is no escaping but by a complete remodelling of the economic structure which forms it basis"
The great October Socialist Revolution itself, its socialist character, at the beginning of the 20th century, in a backward capitalist country with a very numerous peasant and petty bourgeois elements answered in a practical way the quest of the revolutionaries in that period and refuted the supporters of opportunism. The defeat of the revolution in 1905, the Tsarist offensive, and the repression were decisively resisted. The Bolshevik party under the guidance of Lenin regrouped, acquired the necessary strategy and tactics, continued its preparation for the revolutionary overthrow in unfavourable conditions not only of feudal autocracy but also of bourgeois power. Lenin and the Bolsheviks did not choose the lesser evil, they did not lose themselves in the quest for management solutions, they did not treat as absolute the negative correlation of forces which a few months before the October Revolution were negative for the Bolsheviks and in favour of the opportunists in the Soviets and in the elections for the constituent assembly. They made it absolutely clear: "No support for the Provisional Government" " as was stated by Lenin in the April Theses, 1917. "The passing of state power from one class to another is the first, the principal, the basic sign of a revolution, both in the strictly scientific and in the practical political meaning of that term." We mention these things, taking into account the discussion which is being held in the communist movement concerning this period reiterating that the crucial element is the change of the class which is in power and this can only happen via the revolutionary road. This has in any case been demonstrated by many years of experience which can protect us from parliamentary illusions. Taking into account that in no country at any time in history has an exploitative regime been overthrown through parliamentary processes. The classic works referred to the overthrow of capitalism and the necessity of socialism at the end of 19thcentury, at the beginning of 20thcentury. Today, when the material preconditions have matured to an unprecedented degree we have no right to retreat from this position. Some comrades say: "the conditions in each country are different". Of course the law of uneven development leads to differences in the level of capitalist development; there can be differences in the social structure of each capitalist society, different levels in the maturity of the working class’ consciousness, differences in the correlation of forces. The communist parties do and should take into consideration these facts when they elaborate their strategy and tactics, their policy of alliances. Nevertheless, there are several general rules, fundamental principles which wherever violated led to deviations including the so called "Euro-communism" that in the name of national peculiarity violated and abolished every revolutionary principle. The development of capitalism, the global emergence of monopolies is the main issue that determines the fact that the system is in its last, in its imperialist stage and stresses that the material conditions for the construction of the new system, social-communism have matured. The classic works of our worldview analysed many years ago the essence of the issue of national peculiarities. Therefore, the classic reference of Engels in the preface of the American edition of the "The Condition of the Working Class in England" in 1887 is very useful. Engels stresses that "The causes that brought into existence the abyss between the working class and the capitalist class are the same in America as in Europe; the means of filling up that abyss are equally the same everywhere. Consequently, the platform of the American proletariat will in the long run coincide, as to the ultimate end to be attained, with the one which, after sixty years of dissensions and discussions, has become the adopted platform of the great mass of the European militant proletariat. It will proclaim, as the ultimate end, the conquest of political supremacy by the working class, in order to effect the direct appropriation of all means of production Â land, railways, mines, machinery, etc. Â by society at large, to be worked in common by all for the account and benefit of all". 2. The KKE studies and draws lessons from the international experience of the communist and labour movement but also from its own historical course. The most crucial mistakes that entail a high price are related to the abandonment of the ideological-political and organizational independence of the revolutionary party in favour of formations of cooperation, or coalitions. There plenty of examples in the communist movement, which led to a long-lasting setback to the assimilation or even to the dissolution of the Communist Parties. The policy of alliances is a policy of strategic importance. It is determined by the basic, strategic line of the party and this is a very crucial element that requires revolutionary consistency. Every deviation from this duty in the name of maneuvers, temporary electoral gains sets the party back, cancels whatever the CP achieved in the previous period, puts at risk the very revolutionary existence of the party. We underline this fact taking into account the discussion, the confrontation regarding the stance of the KKE at the recent parliamentary elections in Greece in May and June 2012. We will not concern ourselves with the slanders concerning sectarianism. The KKE has answered to this with its every day activity, with the significant positions it has gained within the labour and people’s movement, with its leading role in the numerous class confrontations, in the dozens of strikes, occupations and demonstrations. The answer can also be found in the impact of its positions, in its standing and its role in the political life of the country which exceeds by far its influence in the elections. But we should inform our readers that the slanders concerning sectarianism are launched above all by the class political enemies, including the vehicles of opportunism, who are not able to bring the KKE under their control and confine it to the path of the "realism" of submission and class collaboration. These forces would have praised the KKE if it had betrayed the working class, if it had betrayed our people and adopted a line denying the struggle for socialism, if it had stopped condemning the EU and abandoned its position for the disengagement from the EU predatory alliance and the NATO, if it had decided to take part in a government to manage the system. For that reason, we have drawn attention to forces which represent communist parties and open a front against the KKE at such a shallow -actually very shallow- ideological level to think twice because they will be exposed. We are not talking about substantiated criticism, neither about ideological-political confrontation with arguments. This is permissible and necessary. We are talking about underhand strikes, about the slandering attacks that distort the positions of the KKE and use the allegations of our enemies in order to stigmatize the struggle for the overthrow of capitalism, for socialism (because this is what they are actually doing) with the slander about sectarianism. All parties, all cadres must undertake their responsibilities. They should tell them that the common denominator of the political line of ND, PASOK, SYRIZA and the other parties, apart from the KKE, is their support for the EU, this inter-state imperialist union which, as it has been proved, implements an anti-people strategy and was formed and developed in line with the interests of the monopoly groups and the multi-nationals. They should tell them that a section of the bourgeois class, strong financial groups which control newspapers, radio and television channels supported SYRIZA decisively (this was also true of the state radio and TV channels) while the president of the Greek industrialists proposed a national unity government with the participation of this party. They should tell them that during the course of the elections and especially after the May 6 elections SYRIZA abandoned even its sloganeering phraseology regarding the cancellation of the memorandum and the loan agreement, the nationalization of enterprises etc and adjusted its programme completely to the needs of bourgeois management. They should tell them that a large section of the most corrupt PASOK officials from the regional authorities, municipalities, trade unions and state apparatus played a leading role in manipulating popular forces and PASOK voters in favour of SYRIZA. They should tell them that there is a plan underway to regroup social-democracy which has proven to be very useful for the bourgeois class in order to erode the radical consciousness of the people in favour of the "EU one-way street", attack and control the labour movement. They should tell them that on the eve of the elections, at the meeting with the ambassadors of the G20, SYRIZA provided its assurances to the USA, to NATO. It is worth informing the members, the friends of the Communist Parties about a development that took place after the elections. The KKE tabled in Parliament a draft law for the abolition of the loan agreements, the memoranda and the application laws, the anti-people measures as a whole. This proposal has been discussed within the workers’ and people’s movement and has a wide support. SYRIZA has found itself in an uncomfortable situation as it has actually joined the block of the forces of "renegotiating" with the EU in the name of the "realism" of submission. The attack against the KKE by the forces or right-wing and left-wing opportunism has not taken us by surprise. It is a component of the ideological-political confrontation. Even more so, the KKE was not taken by surprise by the stance of the European Left Party (ELP). The ELP was founded in the framework of the EU, the "Treaty of Maastricht", the strategy of capital. It has accepted the terms and conditions set by the EU. It defends the European imperialist center, favours class collaboration and social consensus, avoids the class struggle like the plague. The communists, the working people must examine the positions of each party and draw their own conclusions. The CC of the KKE analysed with a high sense of responsibility the election result which was negative for our people and our party. It organized essential discussions both within the party as well as with friends and supporters. We discussed about the tactics in the elections, the deficiencies, the delays, the shortcomings. We gathered very useful remarks and elaborated a plan for the activity for the next period. 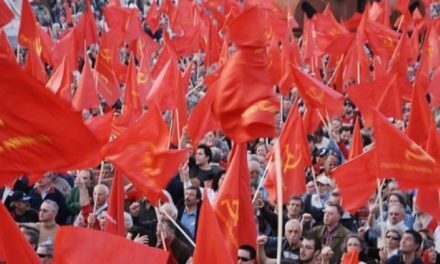 The CC, the leading bodies of the organizations, the members and the friends of the KKE confirmed that the position of the party that rejected the participation in a government of bourgeois management with SYRIZA or other forces was correct and necessary. The forces of the party and the friends of the party support the position that stresses that a revolutionary party cannot have two faces, one in the every day activity and one for the elections; that It cannot struggle on a daily basis for the concentration of forces and the conquest of power and in the elections ruin this work and talk about a management-government in order to satisfy the expectations of the masses for an "easy" and dead-end solution. The forces of the party and the friends of the party support the political line followed by the KKE in the elections. This political line includes the condemnation of the anti-people policy of the loan agreements and the memoranda, the disengagement from the EU and the unilateral cancellation of the debt with people’s power. This position constitutes the core of our party’s activity in this period because it is the answer to the current developments, to the needs of the class struggle from the viewpoint of the interests of the working class, the popular strata. The main issue that emerged and constitutes a significant experience for the international communist movement is whether a communist party participates or not in a government of bourgeois management no matter if it appears with the name "left", "progressive" etc. The choice of the KKE, the choice to reject the participation in a government to manage capitalism took into account that this would entail a loss of votes. This happens because in conditions of a very well organized attack against the KKE, in conditions of a deep capitalist crisis, of very high unemployment, poverty and insecurity there emerges the rationale of "lesser evil" with the popular strata seeking an immediate solution that will contribute to their relief from the acute problems. Nevertheless the KKE maintained a principled position and we would like to note the following. First of all there is a need to fight against the rationale of "lesser evil". It is a very serious problem. Our party -as well- has paid a high price for this in various periods till the beginning of 1990s due to mistakes in the policy of cooperating with "centre" bourgeois powers in order to deal with the anti-people policy of liberal, "right-wing" parties. The rationale of "lesser evil" leads the communist parties to dangerous policies of supporting social-democracy in the name of restricting the electoral power of the "right-wing" undertaking responsibilities for the management of the anti-people policy of the social democrat parties. It leads Communist parties to dangerous policies of tailing politically the bourgeois parties in the name of confronting fascist, ultra-right formations. This experience is very negative. In fact this is the perpetuation of a vicious cycle that deprives of or restricts the ideological-political independence of the communist parties, deviates them from the elaboration and the implementation of a firm revolutionary line that will utilize elections as a form f struggle that will not be detached from the general class struggle, the struggle for the concentration of forces, for the conquest of power. We must chooseÂbetween the existing evil and a very small rectification of it, because the largest number of those who are in general dissatisfied with the existing evil are in favour of this "very small" rectification. And by achieving the small thing, we shall facilitate our struggle for the big one. We repeat: this is the fundamental, the typical argument of all opportunists all over the world. To what conclusion does this argument inevitably lead? To the conclusion that we need no revolutionary programme, no revolutionary party, and no revolutionary tactics (Lenin, Once Again About the Duma Cabinet). Second, the criterion in order to judge a party is not whether it calls itself "left-wing", "right-wing" or "centre" but its programme, its political stance towards the exploitative system, big capital, imperialist unions, class struggle and its prospect. The KKE cannot carry on a political, programmatic or electoral cooperation with parties with parties like SYRIZA and the "Democratic Left" with which it has nothing in common in terms of programme. These parties support capitalism, the EU, the imperialist interstate organization whose strategy, policies, measures are in line with the interests of big capital, multinationals. It has been proven that they turn against the people. This predatory alliance cannot change no matter what the various opportunist groups in Greece are saying or even the European Left Party which fosters illusions among the working people and traps them to the logic of the "EU one-way street". SYRIZA and the "Democratic Left" support the peaceful coexistence of labour with capital and foster the illusion that there can be a path of development that will satisfy both capital and labour which have contradictory interests as it has been proved. These parties are hostile to scientific socialism; slander the socialism which was constructed in the Soviet Union and the other socialist countries. Very quickly the party "Democratic Left", which emerged from a split of SYRIZA, proved wrong those friends from abroad who classified it as a potential ally of the KKE. After taking the votes of the people this party cooperated after the elections with ND and PASOK in the three party coalition government and participates in the implementation of the severe anti-people policy. "The stupid and cruel outrages perpetrated by the police politicians, the encroachments of the Anti-Socialist Law, the Draconian law, the law against parties that advocate revolution, may evoke feelings of contempt and pity; but the enemy who proffers us his hand for an electoral agreement and worms his way into our ranks as a friend and brother is the enemy, the only enemy we have to fear" because as Lenin added "The class-consciousness is corrupted by thefalse friends of the workers …"
No government that manages capitalism, the power of the monopolies and the private ownership over the means of production, no government that implements a programme which is based on the profits of capitalists, on the competitiveness, the productivity and the profitability of the big business groups can follow a political line in favour of the working class and the popular strata. There is no such government that can control the laws of the system and its contradictions or postpone the outbreak of the capitalist crisis. Sooner or later the promises about the "relief" of the people will unravel, they will prove to be hot air while the "wait and see" attitude, the expectations for something better will be followed by the disillusionment of the people, the retreat of the labour movement. Consequently, it is of great significance that the KKE maintained a principled position rejecting the rationale of participating in a government of bourgeois management while at the same time continuing the class struggle against the difficulties, intensifying the struggle for all the problems of the people creating the conditions for the liberation from the bonds of exploitation. Thus, we move forward placing more emphasis on the regroupement of the labour movement, on the strengthening of the class oriented movement, of PAME, on the improvement of the activity and on the class orientation of the trade unions. We place more emphasis on the policy of alliances which we elaborated at the 15th Congress and at the subsequent ones for the construction of the sociopolitical alliance, the construction of the anti-imperialist anti-monopoly front of struggle based on the alliance of the working class with the small and medium-sized farmers, the urban petty bourgeois strata with the participation of women and youth. We continue the effort for the formation of the sociopolitical conditions that will lead to the escalation of the struggle for the people’s power, the disengagement from the European Union and NATO, the unilateral cancellation of the debt, the socialization of the concentrated means of production, the development in favour of the people. It has been scientifically confirmed both by our theory and practice that the utilization of the productive capacities of the country, the development of industry, agricultural production and the other sectors of economy according to the needs of the people requires the solution of two crucial problems that of economy and that of the ownership over the means of production, the development of economy on the basis of central planning.